This marathon Twitter event will run from 9am to 9pm and will highlight how the public can enjoy their local forests, woodland and wildlife. Spring is on its way and this Tuesday (19 March 2013), Defra will harness the power of Twitter and lead a 12-hour “tweet-a-thon” to celebrate England’s forests and mark the first week of spring. This marathon Twitter event will run from 9am to 9pm and together with lots of other organisations, we’ll highlight the ways in which the public can understand and enjoy their local forests, woodland and wildlife. Every hour the public will be able to put questions to a different person who has a unique insight into the workings of our forests. From a National Trust ancient tree expert to a famous foraging chef, members of the public will be able to pick the brains of those who live and breathe our forests every day. At 7.15pm our Minister of State, David Heath, will be online @DefraGovUK answering your forest-related questions in person. The organisations partnering with Defra on #loveourforests include Country Land and Business Association (CLA), Experience Nottingham, Forestry Commission, Grown in Britain, Kew Botanical Gardens, National Trust, Royal Horticultural Society (RHS), Royal Society for the Protection of Birds (RSPB), Trees for Cities, Tree Council, Ramblers and Woodland Trust. To take part, members of the public should have a look at the timetable of events below and simply get online at the right time and start tweeting questions using #loveourforests to the relevant Twitter name. If you’re not sure who to direct your questions to, @DefraGovUK will point you in the right direction. 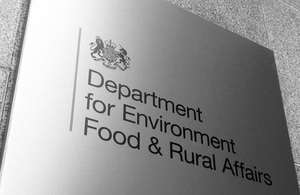 09:00-09:30 @DefraGovUK Defra Introduction to the day and how it will work. The @Defragovuk team will also be there to help direct you to the right person. Justin Cooke, Senior Policy Officer Ramblers Access to woodland and positive ways of working with land owners, industry and government. Sherwood Forest Ranger Notts Tourism Sherwood Forest and tourism. Claire Welsby Kew Ancient trees, history and origins of Kew Gardens, plant preservation activity and the work Kew is doing overseas to preserve species. Heather McIntosh Trees for Cities TfC will be sharing fun photos and facts and asking people to share their favourite memories of trees - this could be your first kiss or tree climbing as a child. They will also ask people to tweet their favourite tree photos to us -the best could get printed in Tree News. Nick Phillips, Forestry Policy Officer RSPB How to spot birds and other woodland wildlife in forests. Chris Reynolds, Woodland Officer, Lincoln Forestry Commission Conifers, trees and the global conservation issues they face, forest resilience to climate change and general diversification of crop species. Paddy Harrop, Recreation & Public Affairs manager Forestry Commission Forest recreation, woodland community engagement, forests for learning, woodland management and forest planning. Dr Kate Lewthwaite, Phenologist Woodland Trust What plants can be seen in the forest at the start of spring and how things have changed in the forest over time and information on how to find your local woodland. Dominic Driver, Head of Woodland Expansion, Forestry Commission Forestry Commission Forestry Commission England’s plan for implementing forestry policy, protecting, improving and expanding England’s woodland, the review of forestry functions and woodland expansion. Mike Seville, Forestry and Woodland Adviser for the CLA Country Land and Business Association Woodland management, tree diseases and why it’s better to build wooden houses. Pauline Buchanan Black, Director General, and Jon Stokes, Programme Director Tree Council Tree Warden Scheme, grants to schools and community groups, community action programmes (e.g. National Tree Week, Walk in the Woods, Seed Gathering Season and the Tree Care Campaign). Guy Barter, Chief Horticultural Advisor Royal Horticultural Society Trees in gardens, urban trees, sustainable use of timber and pests and diseases in trees (particularly invasive species). Mark Lloyd, Chef, Forager, Writer. Eat Real Food Tips on foraging, foraging safely and recipes involving foraged food. Minister of State, David Heath Defra Government policy on forestry. Brian Muelaner, Ancient Tree Advisor National Trust Ancient, notable, and veteran trees.